As the McGregor vs. Nurmagomedov fight gets closer, the bets at Intertops Sportsbook have been getting crazier! The world's first ever online Sportsbook has not only reduced the juice on its odds to win the showdown and offered an attractive stake-back offer worth up to $100 as a free bet, but has also underlined its reputation for thinking outside the box. Odds on the outcome of the fight have fluctuated in recent days with McGregor’s fans still looking to back their hero. 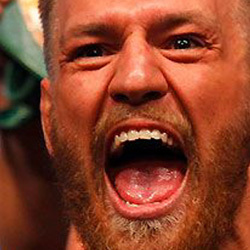 The Irishman remains the underdog at +150 though, whilst his Russian foe is currently priced at -165 to hold on to his title. The fight is scheduled for Las Vegas this Saturday and before both fighters step into the octagon plenty is possible in what has simply been a crazy build-up for all involved in this great sporting spectacle. Odds quoted in video may not be current. Check sportsbook for latest numbers. "Crazy is just the right word when Conor McGregor is around and it looks as though fight fans are really keen to enjoy something out of the ordinary," he added. "We must say that we've been surprised by the popularity of our Crazy Bet offers on the fight!” said an Intertops manager. "Players want top odds and free-bet offers, of course, but the interest in our specials has exceeded all expectations!" Customers that pick the wrong man to win on October 6th will get some of their stake -- up to $100 -- returned as a free bet.